This man [Joseph of Arimathaea] went unto Pilate, and begged the body of Jesus. And he took it down, and wrapped it in linen, and laid it in a sepulchre that was hewn in stone, wherein never man before was laid.... And the women also, which came with him from Galilee, followed after, and beheld the sepulchre, and how his body was laid. According to scripture, Jesus Christ probably died soon after three o'clock in the afternoon, and one might think, as far as the authorities were concerned, "the case was closed". However, for the family of a person executed in Roman times disgrace did not end with death. Roman law provided a harsh accompaniment to crucifixion: the loss of the right to honour the dead. It was only through an act of pardon that the body of an executed person was returned for proper burial. In this respect the narrative contained in the Gospel of Luke is highly plausible. The Jerusalem councilman, Joseph of Arimathaea, who revealed himself to be a follower of Jesus at the Crucifixion, had to bow to convention and beg Pilate, the Roman governor of Palestine, for the body of Christ. Pilate granted this request only after a Roman officer, who had been present at the Crucifixion, verified that the man from Nazareth was indeed dead. What then happened to the body of Jesus is described in the Gospel of John (19: 39—41): "And there came also Nicodemus, which at first came to Jesus by night, and brought a mixture of myrrh and aloes, about an hundred pound weight. Then took they the body of Jesus, and wound it in linen clothes with the spices, as the manner of the Jews is to bury. Now in the place where he was crucified there was a garden; and in the garden a new sepulchre, wherein was never man yet laid." But here was this garden? The gardens of Jerusalem were north of the second city wall, and their presence was indicated by a nearby garden gate. Here were also the quarries, and during Jesus' lifetime, chamber graves were hewn from the rock of these steep slopes. In one of these chamber graves, not far from Golgotha, the "Place of Skulls", Joseph and those with him buried Jesus. This sepulchre is the setting for Andrea Mantegna's The Entombment. The Italian Renaissance painter, who worked for fifty years at the Gonzaga Court in Mantua, had trained his eye for anatomical detail through the study of ancient sculpture. 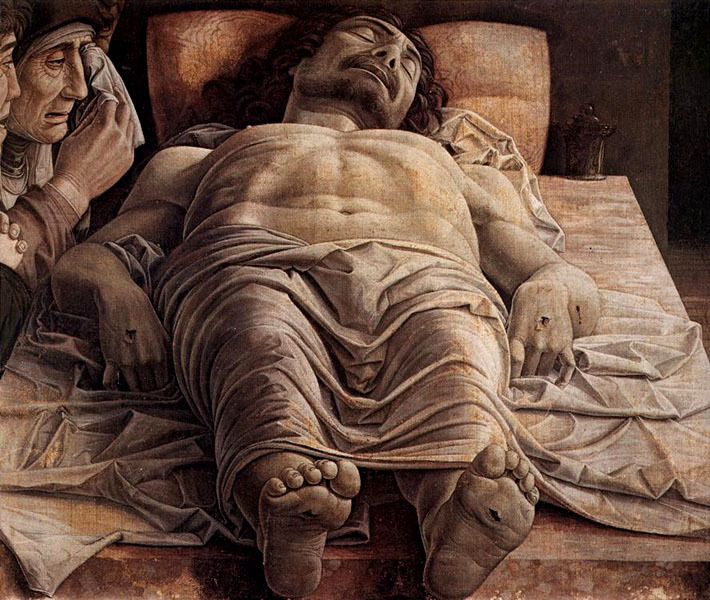 He achieved great plasticity of form in his figures through the use of a perspective technique known as foreshortening, and it is probably not a coincidence that Mantegna depicted the body of Christ lying in a tomb. In 1453, a few years before the picture was painted, Constantinople, the capital of the Eastern Roman Empire, fell to the Turks. When the Ottomans took the city, Christendom lost a precious relic, the "anointing stone" on which, according to tradition, Joseph of Arimathaea had placed the body of Christ. 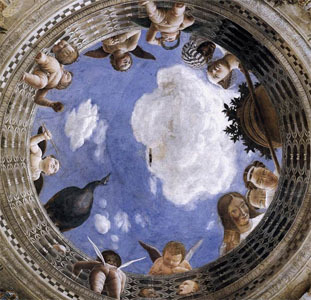 The work by Mantegna could be interpreted as a critical response to the Turks defilement of Christian holy places, since popes of that period called for crusades against the Turks to free Constantinople and the Christian relics from the hands of unbelievers.